Here is a great workout that hits all of your body and will test your strength and core and it will get sweating and will only take about 30 minutes!. Complete each 10 rep exercise sequentially and repeat the workout 10 times through! 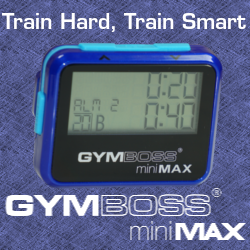 Click on the picture to get your great GYMBOSS timer to keep your HIIT workouts on time! Copyright © 2019. RPE Fitness Inc.